We add a little magic to this week’s list of new books about the Middle Ages. This volume comprises English translations of two fundamentally important texts on magic and witchcraft in the fifteenth century: Johannes Hartlieb’s Book of All Forbidden Arts and Ulrich Molitoris’s On Witches and Pythonesses. In this evil, wretched art of nigramancy there is a form of foolishness that people carry out with their tricks of sorcery. Horses come into an old house, and if one wishes he can mount them and ride miles in a short time. When he wants to dismount, he holds onto the bride, and to mount again he shakes the bridle, and the horse returns. The horse is in fact really a devil. For such sorcery one needs the blood of a bat; using it, a person must devote himself to the Devil with secret words, such as “debra ebra.” This practice is widely known among princes. Your princely grace should shun it, for it would truly be a pity if your elevated mind should be caught up in and led astray by any such operation. Excerpt: My chief concern in writing this book has not been to dismiss or berate inaccuracies in our understanding of those medieval concepts, not to complain about their reuse in a context not designed to contain their multiple, varying and complex meanings. Instead, the main focus is to examine how and why ideas, events, facts and concepts that emerged or were prevalent during the the Middle Ages have been reused in modern mass and social media, why they are still useful for us and to what purpose they are used. Thus, I argue, the ways in which the Middle Ages are used in modern political rhetoric might well be of interest to academic historians, where they often underpin the ways in which we understand our world and out interaction with others in it. Staffs are some of the oldest ritual tools in human history, serving as important attributes of gods and supernatural beings. Created from specific materials, endowed with supernatural qualities through the words and gestures that their bearers employed, these were powerful objects with a multitude of applications. This book investigates the idea of (magic) staffs in the worldviews of the Viking Age Scandinavians and discusses their meanings using both literature and archaeology. Based on a comprehensive study of Old Norse texts and previously unknown archaeological evidence, it provides a history of these objects and uncovers their various forms, purposes and symbolism. From the riddling song of a bawdy onion that moves between kitchen and bedroom to the thrilling account of Beowulf’s battle with a treasure-hoarding dragon, from the heart-rending lament of a lone castaway to the embodied speech of the cross upon which Christ was crucified, from the anxiety of Eve, who carries “a sumptuous secret in her hands / And a tempting truth hidden in her heart,” to the trust of Noah who builds “a sea-floater, a wave-walking / Ocean-home with rooms for all creatures,” the world of the Anglo-Saxon poets is a place of harshness, beauty, and wonder. 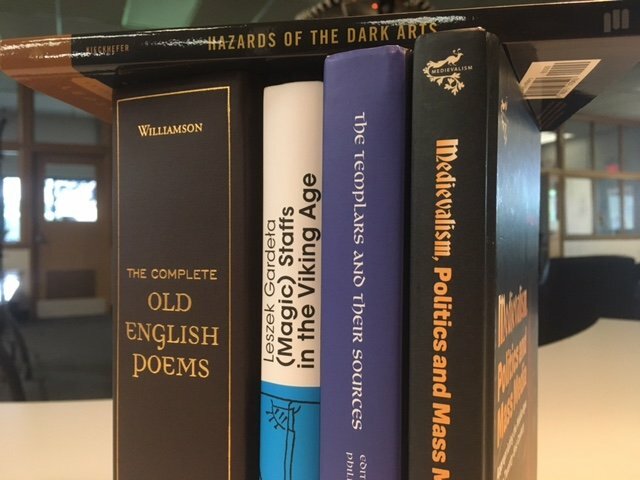 Now for the first time, the entire Old English poetic corpus — including poems and fragments discovered only within the past fifty years — is rendered into modern strong-stress, alliterative verse in a masterful translation by Craig Williamson in this 1248 page book. A blaze of brightness, a branch of fire. Where princes rest in its welcome warmth.